Luton dug in to secure a priceless three points at Grimsby Town on Saturday. The Hatters went down to 10 men after just half an hour when Jordan Cook was sent off, but James Collins’ winner early in the second period was enough for victory. Read how the Town players rated here. Marek Stech 7.5: After the woodwork came to his rescue early on, was well protected by his defence for long periods as Grimsby had precious chances of a clear-cut nature. Positioning and handling was good, taking some late crosses in another excellent shut out. Jack Stacey: 7.5 - Never a game where he was going to be able to motor up and down the right flank so kept things solid. Heart would have been in his mouth when Dembele went over inside the area under his challenge, only for the sub to see yellow for diving. Dan Potts: 8.5 - Was in the right place on numerous occasions to head clear when Grimsby threw balls into the box as the game wore on, showcasing yet again his impressive defensive talents in clearing set-pieces. Johnny Mullins: 8.5 - Big part of why Luton kept their 14th clean sheet in the league this campaign as he stood firm under the Mariners’ direct approach late on, often reading the play well to avert the danger. Alan Sheehan (STAR MAN): 9 - Recalled to the starting line-up after his suspension and showed just why he has been so important for the Hatters with another top-notch display. Organised well and took some punishment from Matt’s gangly style as Luton stood strong aerially. Glen Rea: 8.5 - Restored to his favoured holding midfield role and demonstrated just how much he has improved this season. Was in to win the ball back on numerous occasions and provide that extra line of defence for the back four. Luke Berry: 7.5 - Always harrying and harassing his men in the second period as he looked to nick possession back and earn Luton some breathing space. Wonderful free kick led to Town’s winner as it was in all the way but for Killip’s touch. Andrew Shinnie: 7 - With Luton out of possession for long periods in the second half had to do a lot of chasing down and pressurising, which isn’t his game. However, he rolled his sleeves up and did just that in a committed performance. James Collins: 5.5 - Ball didn’t stick as well as it might have upfront in a display that boss Nathan Jones called ‘average’ afterwards. Proved his worth by losing his markers to take the only real chance that came his way and win it for the Hatters with goal number 13. Harry Cornick: 8 - Striker had a quiet first half but when Town were under the cosh in the second period, showed exactly why he is such a handful to League Two defences. 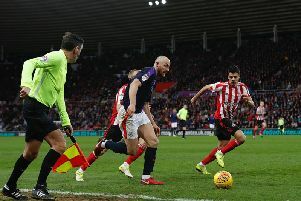 Didn’t allow the Grimsby back-line to settle, always giving them something to think about and close to a second when he charged down keeper’s clearance. Lawson D’Ath (SUB): 6.5 - Ensured Luton had some more legs in the closing stages and had he kept his feet, might have been able to give Town some breathing space with a three on one counter. James Justin (SUB): 6.5 - Another who helped Town stay solid late on. Elliot Lee (SUB): 6 - On in stoppage time as Cornick took a knock.